The interaction between regulation and private industries is highly complex. Since 2008, the federal government has imposed $733.9 billion in regulatory costs. American Action Forum research indicates the cumulative cost of all regulatory compliance devastates small businesses. 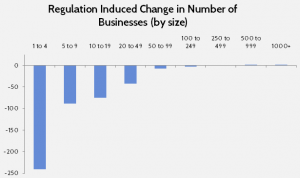 Specifically, for every 10 percent increase in regulatory costs in an industry, the number of small and medium-size businesses in that industry falls 3 to 6 percent. The number of large businesses, meanwhile, grows 2 to 3 percent. Generally, regulatory costs are fixed, meaning that if all businesses are forced to deal with hundreds of hours of new paperwork, the costs of hiring an additional compliance officer will fall disproportionately on small institutions. – Today, there are more than 236,000 regulatory compliance officers and they command average salaries of about $66,000 annually. – A 2013 Minneapolis Fed study emphasized the paperwork burdens and what being forced to hire compliance staff means for small banks. The study found that hiring two additional compliance officers reduced profitability by 45 basis points (roughly half-a-percent) and that one-third of the small banks studied would become unprofitable. – The Environmental Protection Agency’s greenhouse gas regulation reporting rule noted that costs per entity for the smallest firms would be 1.32 percent, compared to 0.02 percent for the largest companies. In other words, for the reporting rule, regulatory costs are 65 times more burdensome for small businesses. Despite regulatory reform designed to protect small businesses, sheer economies of scale and unchecked regulators have made life for small employers incredibly burdensome.